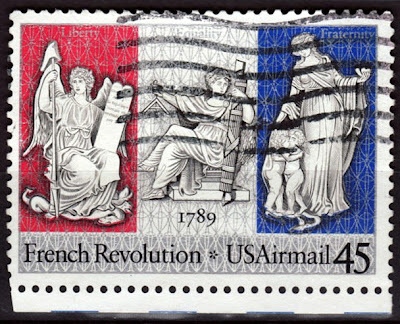 It is hard to tell from the scan of course, but part of the appeal of this stamp is its size - it is about double the size of a standard stamp. A nice stamp, yes? Of course, there are plenty of stamps featuring the Australian flag in my collection, so I thought I better share one of them too. I like this one because it has a bit of a tech-y computer-chip thing going on, to make it more interesting. 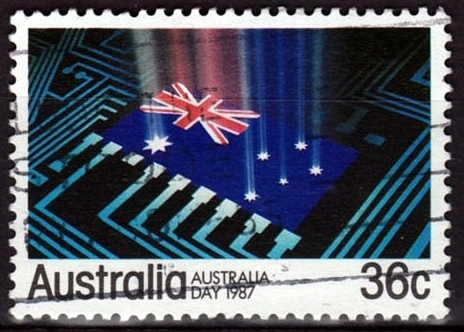 The Australian flag features the Union Jack, the seven pointed star representing the Commonwealth, and the southern cross. I also started pondering alternative Australian flags, and hoped that I would be able to share a stamp featuring the Aboriginal flag - but alas, there doesn't seem to be one in existence. This is a bit sad, in my view. I think Australia Post should rectify that, quick stat. The other alternative flag I thought about was the Eureka flag. 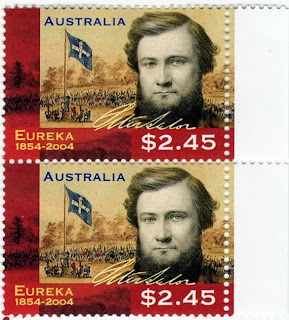 The Eureka Flag, which pre-dates our national flag, also features the southern cross, and was born out of a miners strike on the Ballarat goldfields in 1854. The flag is now used by the Workers Union movement. 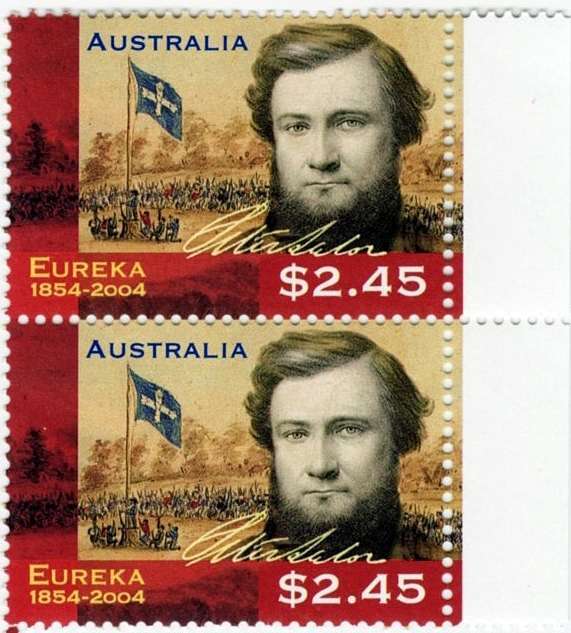 The Eureka flag has been chosen by Australia Post to feature on a stamp, and I have a mint pair. I really like that the image features a rippled fabric effect. The gold diggers at Ballarat were fighting their own revolution against an unjust licensing system and a corrupt administration. And in a way, Lalor's oath ties in nicely with the mantra of the French Revolution, taking us back to our starting point: Liberty, Equality, Fraternity. Thanks for joining me once again for Sunday Stamps, please click on the link to find out what other bloggers have been pondering in relation to flags and stamps. The fabric effect on the Eureka flag is excellent. So much better than a flat representation. But my favourite has to be the Christmas parcels! Who doesn't love Christmas parcels? Christmas parcels from the world, perfect. The Eureka flag is one I have not seen before, we have trade union banners but not an overarching one like this. Interesting post. 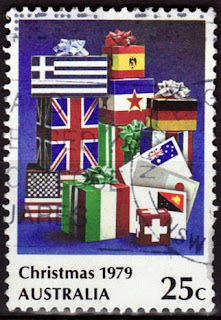 I especially like the Christmas stamp. I have to agree with the above comments...the Christmas stamp is my absolute favourite! it also in a way reminds me of suitcases for travelling around the world, and due to the nostalgia in me, this stamp is even more special coz of the Yugoslavian flag...awesome! Apart from the connection of the Statue of Liberty does anyone know why the USA commemorated the French Revolution? Thanks for the story behind the Eureka flag. I love the cloth Eureka flags - very elegant. @Bob - the Statue of Liberty was a gift to the United States from the people of France to commemorate the 100th anniversary of American Independence; an exact Statue of Liberty replica monument was offered to the French by the American residents of Paris as a remembrance to commemorate the French Revolution...bonds of friendship! The Eureka flag and story is new to me, so thanks for that. The Christmas stamp is a lovely idea, but I wonder how they chose the countries to be represented? 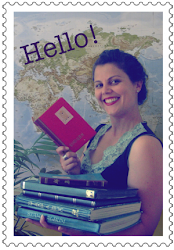 An interesting post and lovely stamps! that is dedication, to go to a party bearing stamps to scan. that would be me for sure if our scanner ever broke down. thanks for the information on the Eureka flag and background. And thank you for joining in this week. my most favorite of all your stamps is the Christmas stamp,so neat!